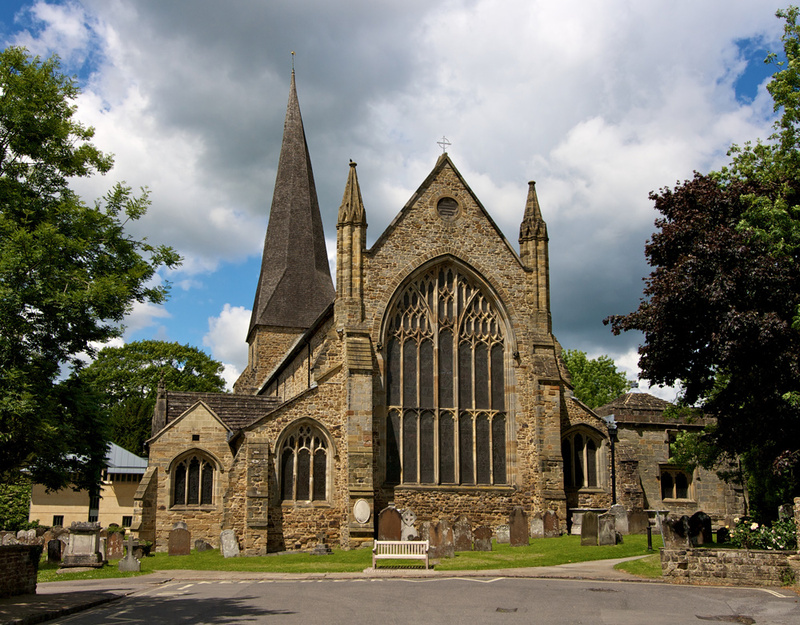 The life and witness of early Christians in Horsham eventually led to the building of a Norman Parish Church (traces of which are still to be found at the west end) and then to the foundation of the current St. Mary’s in about the year 1247. Details of the gradual reshaping of the building through the centuries can be found in the Guide available in church, and a summary is also given below in an article written by Mrs Jane Bowen (our Parish archivist) in connection with a restoration appeal held in the 1990s. Since Victorian times, the growth of Horsham has led to several “sister” churches being planted – and we continue to have very close links with St. Mark’s in North Horsham, Holy Trinity in Rushams Road, St. Leonard’s in Cambridge Road, and St. John’s in Broadbridge Heath . Since 1986 our 5 churches have worked together as a Team Parish (which is currently subject to a systematic review at the time of writing), led by a Team Rector at St. Mary’s and 4 Team Vicars – and each congregation has flourished under this arrangement, covering between them a wide variety of different worship styles. The Parish Church of St. Mary the Virgin is the oldest existing building in Horsham. It has been associated with the life and worship of the community and in continuous use for nearly eight centuries. Its picturesque location at the end of the Causeway, the focal point of today’s conservation area, links it with the town it serves, and the peal of 10 bells rung regularly from the tower can be heard throughout the surrounding area. Originally a Norman church occupied the spot and remains of this church are to be found in the tower, the west door and the north- west wall. A new church dedicated to St. Mary the Virgin, was completed in about 1247. At the time the church was consecrated Horsham was a rapidly expanding market town and this very spacious building not only provided for the spiritual needs of the people and a focus for the community but reflected their civic pride and increasing prosperity. Over succeeding centuries townspeople have worked to maintain and enrich the church, and their tombs and memorials show how important this relationship has always been. Despite alterations and additions the Church has remained substantially the same since the early 13th century and is unusual for the period in having a uniform style of architecture known as Early English. A particular characteristic of the building is that the nave and chancel are of equal width, and, in the late 13th century, the roof with a continuous ridge was raised to its present height, involving some easily detectable changes to the tower. The Church largely escaped the worst desecration common during the upheavals of the 16th and 17th centuries. As it stands today the exterior of the Church, despite some changes, would be easily recognisable to our forbears. The interior, however, has been altered more frequently to reflect fashion and need. In the 18th and early 19th centuries the church fabric became dilapidated and the building unstable. According to the Parish Magazine of June 1869 it had ‘threatened to bury the worshippers in hideous ruin’, despite various rescue measures adopted to make it secure. Photographs of 1864 show an overloaded and rather derelict church, filled with wooden galleries and high box pews – the renting of which had caused many bitter disputes. In one case, when the owner of a pew died with no heirs to take it over, the Vicar and one churchwarden (of which, unusually, there have always been three) immediately rented the pew out to another family. However, the following Sunday a member of the original family took her place in the pew: there was a great furore and the dispute became something of a public cause célèbre. In 1865 under the guidance of the architect, S. S. Teulon, a remarkable feat of engineering secured the structure, the galleries were taken down and the east window was rebuilt, financed, as the West Sussex Gazette of November 16th, 1865, explained by a “fund got together by the untiring exertion and perseverance of the ladies’ committee”. In addition a new south aisle was added to compensate for the loss of the galleries and the interior restored. Unfortunately, some of the stonework was not of lasting quality, hence the need for today’s very urgent restoration. The churchyard containing 1,175 listed items, in which many familiar Horsham names are to be found, has long ceased to be used as a burial ground. The earliest is a brick tomb with Sussex marble slab, on the south side of the church, to Richard Dendy and Joan his wife who died in 1690 and 1693 respectively. Some of the slabs in the paths cover vaults where several members of a family are buried. In the past the churchyard was fenced in with a padlocked gate. The Church belongs to the Vicar, and is held by him in trust for service to the whole town. Since Roger of Wallingford, appointed in 1231, there have been 42 vicars of Horsham, some of whom have memorials in the Church. One of the best remembered was the Revd. John H. Hodgson who was Vicar from 1840 – 1883. He lived with his large family, in the present vicarage, built in 1840, the old one on the edge of the Churchyard having, even in 1724, been described as ‘old and ruinous’. As a permanent memorial to his 44 years incumbency, the North Porch was renovated in 1884 “by his wishes and in grateful recollection of the complete and happy restoration of this church AD 1865 effected during his ministry. A plaque records his impressive list of achievements. That so much is known about the Church is due to the fact that there are very good written records still in existence. Registers of baptisms, marriages and burials dating from 1540 are to be found in the West Sussex Record Office at Chichester. The 17th century Churchwardens’ Accounts dating from 1610 have some interesting entries concerning the varied duties, clerical and civil, of the churchwardens, which included upholding ecclesiastical law, overseeing the church fabric and administering poor relief. They frequently had to prosecute offenders such as adulterers. absentees from church and swearers – in 1646 John Carpenter was fined 12d. for ‘swearinge’ and John Chapman was Fined 5/- ‘for being drunck on ye Lordes day’. Some of this revenue went towards small expenses, such as “keping the dogs out of ye Church” or ‘watching in the Church’. Men working in the Church were often provided with beer and bread. Repairs and maintenance were an on-going expense caused by wear and tear, vandalism and costly Acts of God. In 1615 the steeple was struck by lightning and set on fire, the large bell damaged and a girl called Elizabeth Strode standing near the belfry door was killed as a result. Under the Elizabethan Poor Laws, culminating in the Act of 1601, the Parish was legally responsible for the poor. Although some of the revenue from fines went to fund outdoor poor relief, most of the money was raised by a poor rate, some records of which still exist. In 1665, at a meeting of the Vicar, Churchwardens, Overseers and Inhabitants of 30th July it was decided that “from 4th August all poore people … in the poore book receiving relief had to wear on their right arm two letters HP in yellow and blue … four inches long and one inch in breadth.” If they didn’t — no relief. The history of the Church is one of continuity and change. The responsibility for maintaining this heritage, carefully and lovingly passed on to us, is as important today as at any time during the last 800 years. At the start of the 21st century, the life of the Church goes on for worship, to celebrate our joys and witness our sorrows, for civic functions, for music making. The Church is maintained to a high standard and memorials to past parishioners continue to enhance the building. Now, under the guidance of the Vicar and Churchwardens, vital restoration is being carried out, to ensure the future of the fabric for a long time to come.